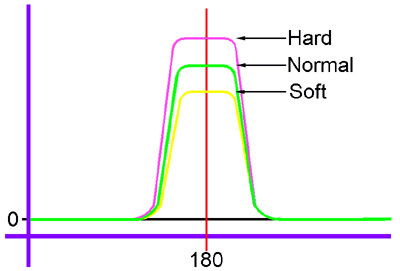 Got Problems with Part Surface Hardness Variation? Using this technique you can monitor part hardness variation on every part as it is being made...hit after hit! The Signature Technologies SA-2000 “SAM” module, and Signature Technologies “SamView™” Software package can be used to monitor the hardness of material feeding into a Punch press to insure that its characteristics are proper for the process being performed. 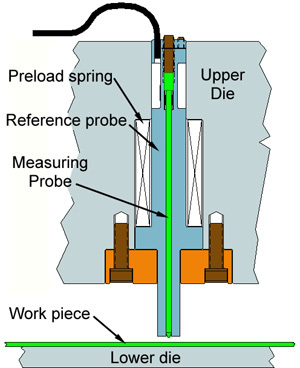 Rather than sampling occasionally using a superficial hardness tester, the illustrated probe can perform the same type of test every stroke of the machine so that each part can be individually verified as being with a certain range of material hardness. The system works by measuring by force inference how deeply the probe embosses the subject material each stroke of the press. The probe is arranged in such a way that variations in the press stroke are canceled out, and do not effect the measurement. The measurement can either be calibrated, or comparative depending on the application. Measurements calibrated in familiar units require post processing to linearize the response of the sensor. It is recommended that the sampling location be in an area of the work piece, which is either centered, OR close to a “Material Variation Critical” area of the part. It should be located in a position that will be blanked out in the finished part if possible - OR a location where the testing embosses will not be a problem in the finished part. Probes can be designed for various ranges of hardness, and materials. The indentation in most cases will be less than 0.010 deep. In the signature to the right the amplitude (peak) appears to be the monitored variable but it is actually the phase difference in the leading portion of the signature the provides the most reliable information. The amplitude can vary considerably due to noise since the system is no longer in compliance (work is done as one approaches the peak).